The United States Congress designated the Hercules-Glades Wilderness (map) in 1976 and it now has a total of 12,423 acres. 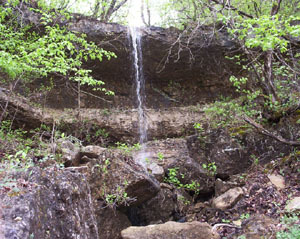 All of this wilderness is located in Missouri and is managed by the Forest Service. Some of the most scenic country in Missouri, perhaps in the Midwest, lies protected by the Hercules Glades Wilderness: open grassland, forested knobs, steep rocky hillsides, limestone outcroppings, a maze of narrow drainages, and hollows cut by water. The high points of Coy Bald and Pilot Knob stand more than 600 feet above Long Creek, one of only two (along with Cane Creek) year-round sources of water. Redbuds and dogwoods flower beautifully in spring, and smoke tree and maple vividly paint the fall. Glades of prairie grass often open a forest dominated by eastern red cedar and oak. This is a fine home for deer, raccoons, rabbits, squirrels, turkeys, and quail. Rattlesnakes and copperheads may be encountered. Rare but well-documented sightings report roadrunners, tarantulas, and collared lizards. Missouri's second largest Wilderness is small and easily accessible. Thirty-one miles of maintained foot and horse trails cover virtually every ridge and hollow of Hercules Glades. The primary east-west trail, although unnamed, is easily followed from maintained parking lots on either end. The hiking is moderate and backcountry camping is allowed, but subject to water and trail setback restrictions . On or off trail, this is a chance to backpack wild Missouri at its best. Planning to Visit the Hercules-Glades Wilderness? How to follow the seven standard Leave No Trace principles differs in different parts of the country (desert vs. Rocky Mountains). Click on any of the principles listed below to learn more about how they apply in the Hercules-Glades Wilderness.